"What Happened Then?" 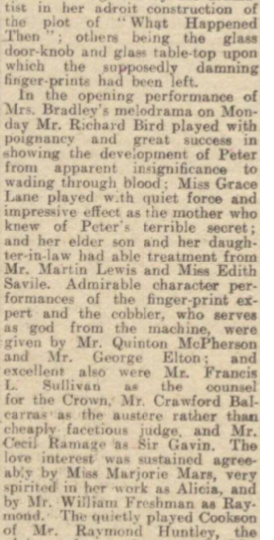 was the first of a run of one week plays at the Fortune, and was written by Miss Lilian Trimble Bradley. The cast of 25 included Mr Richard Bird, Martin Lewis, Miss Grace Lane, Miss Marjorie Mars, Mr George Elton, Mr Cecil Ramage and Mr Charles Mortimer. Interestingly, competition from the cinema meant that the theatre cut their prices to between 5s and 1s 6d. 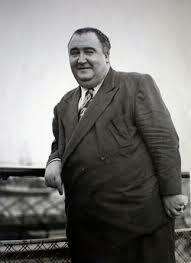 From The Stage of 14 September, 1933. 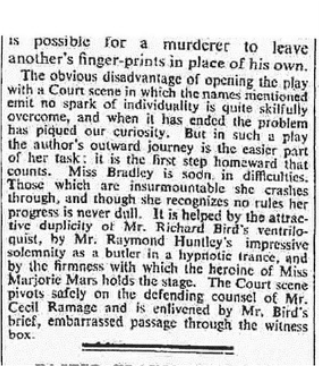 With kind permission of the Times, 31 August, 1933. 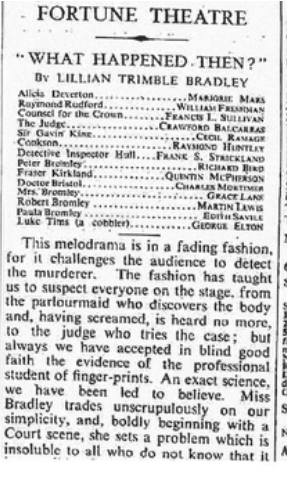 The Stage - 14 September, 1933. The Fortune, London. 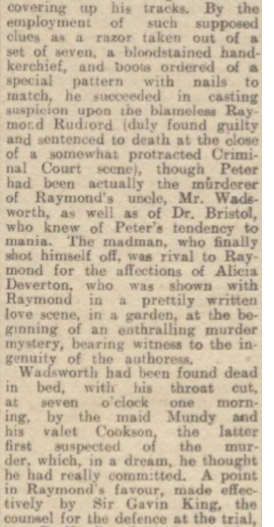 "The quietly played Cookson of Mr Raymond Huntley, the plain speaking doctor of Mr Charles Mortimer and the detective inspector of Mr Frank S Strickland were other good assumptions that helped complete the marked effect made by this murder melodrama." Charles Mortimer played Dr Bristol, in the Fortune Theatre production of "What Happened Then?". 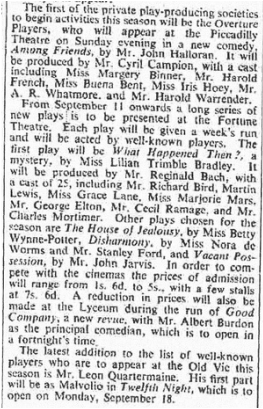 The play ran from 11 - 26 September, before transferring to the Kingsway, 18 September until 7 October, and finally to the Garrick, from 23 October to 11 November, 1933. The cast included Francis L Sullivan and Raymond Huntley.